Jim and Beth had been tangling for weeks. Finally, Jim asked to meet with Lars, Beth's boss. He would ask Lars to talk to Beth. By making Lars his agent, Jim was dealing with Beth indirectly. He was triangulating Beth by asking Lars to fix the problem. His approach was more direct than most — the triangulator usually complains to anyone who will listen, out of the hearing of the target. Triangulation rarely works, and when it fails, it can fail catastrophically. Here's why. At a conversational distance, we can maintain real contact with only one person, because our eyes, ears, and mouth all point in the same direction. And most of us can listen to only one person at a time. When three people are in conversation, one is "on hold," while the other two are in connection. We've all experienced being on hold. As infants, we watch in befuddled left-out-ness as our parents converse. Most of us are uncomfortable on hold. We search intently for pauses where we can "break in," or we tire of waiting and just break in anyway. Or worse, we tune out. For most of us, triangulation pushes powerful buttons that were installed long ago. 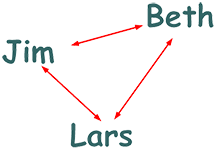 When Jim triangulated Beth through Lars, he created a triad. While he and Lars were in contact, Beth was on hold. Aware of the tension between herself and Jim, Beth eventually became uncomfortable, worrying about Jim discussing anything with her boss with the door closed. Later on, when Lars spoke with Beth, Jim was on hold. In his turn, he experienced left-out-ness as Lars and Beth talked privately. All of this increased the tension. Now add the "telephone effect" — any message passed between Jim and Beth through Lars is jumbled somewhat by Lars. Lars cannot be a perfect transmitter, because he brings his own perceptions to any communication. long agoMoreover, both Jim and Beth tend to slant their views most favorably toward their own positions, because their partner in conflict isn't present to refute their claims. Offer to arrange a joint meeting, and volunteer to mediate, if you have the needed skills. If you don't feel that you can mediate effectively, offer to help find a mediator. If action is urgently needed, and you have the skills, offer to meet with both of them right now. Avoid listening to one side privately — it compromises your neutrality, making you less useful as a mediator. Would you like to see your comments posted here? rbrenxEmDquaFqRZnVUiBner@ChacMcczRjhaSDJqPreNoCanyon.comSend me your comments by email, or by Web form. I offer email and telephone coaching at both corporate and individual rates. Contact Rick for details at rbrenuizvMOngdiWZEkzNner@ChacVqIdteZbHMqgRvRmoCanyon.com or (650) 787-6475, or toll-free in the continental US at (866) 378-5470.